With colder weather fast approaching everyone is concerned over coming down with colds, the flu, or other winter-time illnesses. It makes sense to take steps to stay healthy. The idea of “boosting your immune system” sounds inviting. But what does this really mean, and can it be done? The immune system consists of the parts of the body that fight infections. There are three body parts generally considered part of the immune system. · The lymphatic system consists of lymph nodes that filter the lymph fluid and lymph vessels that carry away waste materials. Lymphocytes also enter the lymph fluid and destroy bacteria, viruses and other foreign substances. · The bone marrow produces various types of white blood cells that fight infection. Red blood cells are also made in the bone marrow, but they have no role in immunity. · The spleen filters the blood, removing old and damaged red blood cells, white blood cells, platelets, and other foreign substances. Simply put, the immune system keeps you healthy by fighting off invaders such as viruses, bacteria, fungi, parasites and other nasty organisms. When working properly, it quickly destroys the invaders, preventing illness and harm to your body. The white blood cells are the first line of defense for invading bacteria and viruses inside infected cells. They work by killing and then removing them from the body. Antibodies are the first line of defense against viruses in the blood. In other cases, the white blood cells may mistake a person’s own cells for invaders, resulting in potentially serious conditions call autoimmune diseases. A few examples are rheumatoid arthritis, lupus, celiac disease, and others. How Do Antibodies and Antigens Fit into the Picture? Antigens are substances that the body recognizes as foreign and cause an immune response – the creation of antibodies. Antigens are found on the surface of invaders and cells infected by them. Each invader has its own antigens that differ from other invader’s antigens. Even different strains of the same virus may have different antigens. The flu virus mutates or changes every year so it has different antigens. That’s why you need a flu shot every year. Antibodies are proteins that attach to specific antigens. They help the white blood cells recognize and destroy the viruses, bacteria or fungi invading the body. In most instances, once the immune system has successfully repelled a certain type of invader, immunity develops to that specific germ. This means the immune system is “primed” in case the same invader attacks again and can effectively fight it before you get sick. Many illnesses, such as the common cold, can be caused by hundreds or even thousand of different germs. That’s why people keep getting colds. Each is really a different illness – it’s just all have that same set of symptoms so we think it’s the same illness. How Do I Keep My Immune System Working Well? Where, you may ask, do vitamins, supplements, and herbs fit into keeping my immune system healthy? If your diet is well rounded and includes a variety of fruits and vegetables, then you shouldn’t need any extra vitamins. Megadoses of vitamins have not been shown to have any positive effect on health or immunity. Similarly, no studies have demonstrated any beneficial effects of dietary supplements or herbs for healthy adults. That said, your doctor may recommend supplements for particular age groups or health conditions, including calcium or other nutritional supplements. Yes – there are steps you can take to lessen your chances of getting sick this fall and winter. First, you can take steps to avoid becoming sick. These include good handwashing. Germs can be transmitted from one person to another by contact. Try to avoid being around sick people. The problem is that for many common illnesses a person is contagious for a day or two before they display any symptoms. Perhaps the most important thing you can do is be fully immunized and get a flu shot every year. Vaccines work by “fooling” your immune system into thinking you are infected with a certain illness. The immune system develops antibodies for the illness and thus is “primed” to fight that specific germ if you become exposed. What the person has isn’t the flu. It may a respiratory illness caused by a different virus, but not the influenza virus. The person had been exposed to the flu a day or so before getting the flu and there wasn’t enough time for her body to develop immunity from the shot. The flu virus is one not included in the vaccine. The best way to stay healthy is eat a well-rounded diet, exercise, and be up-to-date on your immunizations. That includes getting a flu shot every year. There is no proof that multiple vitamins, specific vitamins or minerals, megadoses of any vitamin, herbs or supplement affect anything except your wallet. All of these childhood vaccines are given in a series of 2 or more doses, at specific ages. 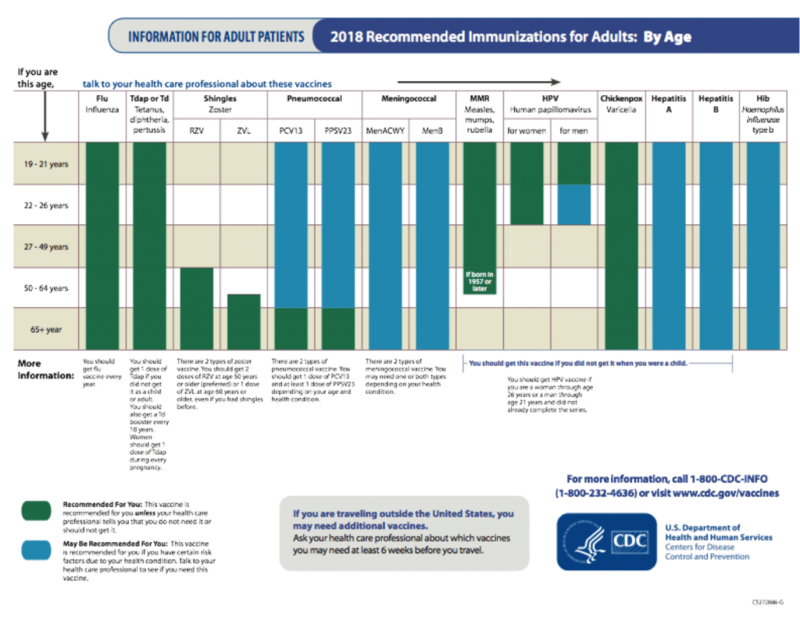 For some of these vaccines, a booster dose is also recommended at 4-6 years of age. A dose of flu vaccine is recommended every winter for children 6 months old or older. Richard J. Sagall, MD, is the president and co-founder of NeedyMeds. He spent 25 years practicing family and occupational medicine. He now devotes his time to NeedyMeds and Pediatrics for Parents (www.pedsforparents.com), a children’s health newsletter.